I guess I'm continuing in the war theme. Click for the PDF. Questions, comments, observations welcome, as always. It looks like there's much to choose, decide during the game. Is it a player's job to decide what happens with his people, not MC's? It looks more complicated than AW. More crunchy? Like more thinks are directly connected to numerical values. Will it be possible to play to new players, as with the playbooks? Aleksandra: Aha! 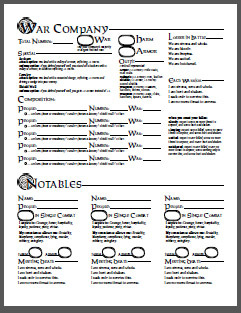 As it happens, this sheet is a mix of player's stuff and MC's stuff, and I'd probably do better to separate them. Thanks! The Dark Age is slightly less crunchy than Apocalypse World proper. I think it'll be just as easy to play. Fabulous! What's the War field for, next to Numbers? Spigot: Oh sure. It's a stat. Sometimes you roll your company's War. Counting the fallen seems a satisfying move, does the whole gang harm/individual harm thing in much more immediate and comprehensible a way. I suspect a lot more cross referencing will be required to get a handle on what you can do though, (just picturing my friend swapping between sheets) paper management is a skill that rpgs often assume, I've seen a few games like Apoc World casually side step it. Specifically, what are the possibly consequence of battle for my guys? Check basic moves sheet, war rights sheet, check company sheet/raiding band sheet. If you can stick a company, the war rights, and the raiding party on the same sheet, including through double sided printing, that will help, as people will be able to get out different sheets for different kinds of conflict. As we currently have three sheets, this is not a high concern though! Where does hunger go on that sheet? So far, I am loving what I've seen of the Playbooks, although they feel less 'focused' than the ones of the previous beta (which is not good or bad by itself). Of course, without looking at all of them in the context of the rules, my impression might be totally wrong. I really liked the feeling of the War Company sheet: if there are enough topics and enough "side"-sheets, it might get very interesting. Having a personal Playbook, and then separate sheets with a broader scope in intriguing! Well, I've seen the warband only, so far, but I guess there will be something similar for a cult or followers, and/or something for nobility, holdings and so on - or am I totally wrong? DWeird: When you asked, at first I was like "well, maybe I don't care about how hungry armies get?" but that was obviously untrue, so I've been pushing it downstream until this morning. This morning I realized the obvious way to handle it and it'll be good. Hunger doesn't go on the war company sheet, it goes on the sheet of the population supporting the war company. Davide: Not wrong! There's a sheet you use for any group of people, be it a cult, a holding's population, an ethnic group, a ruling class or downtrodden class, anything.